Facilities Enjoy an easy time in an elegant space. and so you can enjoy yourself the moment you set foot into the hotel. There are many famous Japanese restaurants in the area around Sowaka. But depending on how you feel, sometimes you probably want to try something other than traditional Japanese food. If so, please dine at Sowaka’s restaurant. 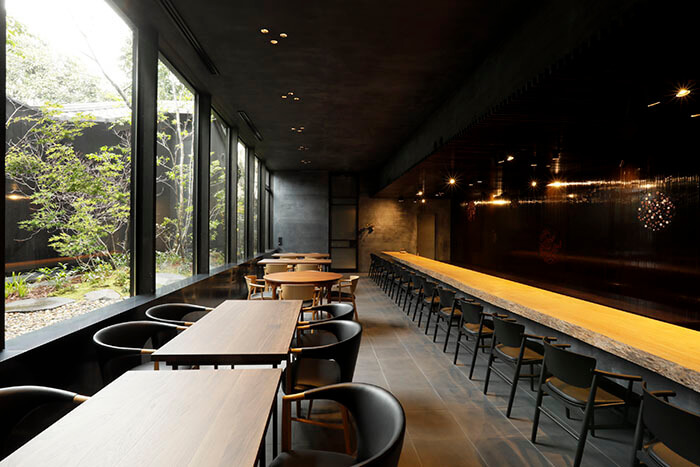 At La Bombance Gion, which means “feast” in French, you can experience new cuisine, prepared based on Japanese cuisine, but served no where else in Kyoto. Details about the food are here. Upon arriving at Sowaka, please make yourself at home here while we take care of your luggage and serve you a welcome drink. 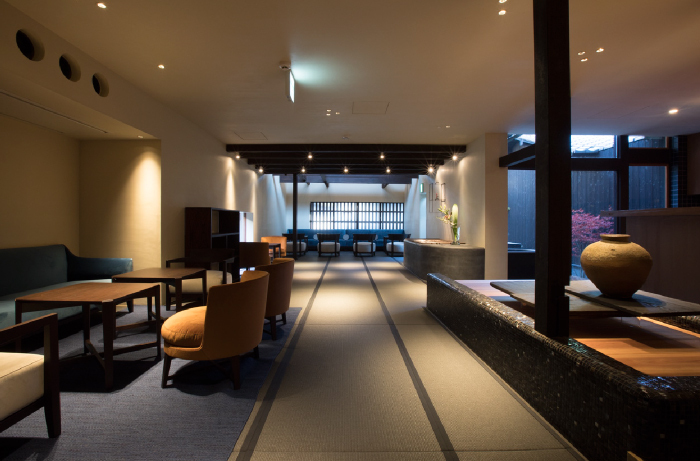 This luxurious space, with its beautiful contrast between the black tatami mat floor made of Japanese paper and the plastered wall, contains a library of books about sukiya, which we invite you to peruse during your stay. 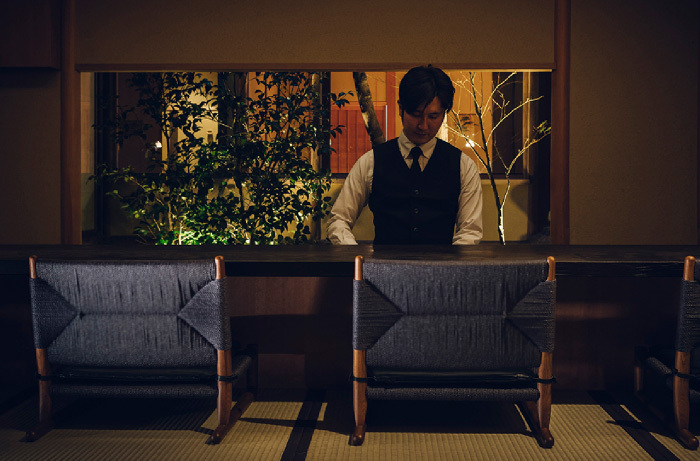 This tatami-matted bar, equipped with a counter, is in a renovated room designed by Kyoto master craftsman Sotoji Nakamura. Serving liquor and wine of Japan, this bar offers Japanese sake, shochu and whiskey distilled in Japan. This private setting, seating only four guests, is also a good place to relax and read during the day. 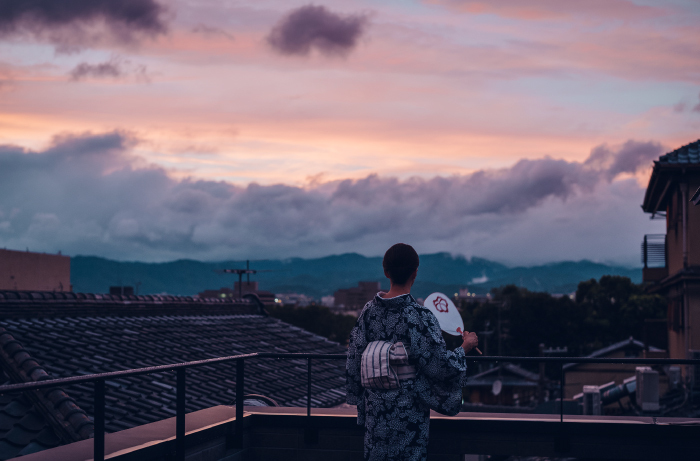 A top Sowaka’s main building is a roof balcony which affords a wonderful view of Higashiyama and the town of Kyoto beneath an open sky. During the summer, how about relaxing in the cool of the evening with a beer in hand, while viewing Kyoto’s Gozan Okuribi (Mountain Bonfire) and Buddhist lantern festival? On the roof balcony, there are multi-themed events depending on the particular season of the year, exclusively for hotel guests.